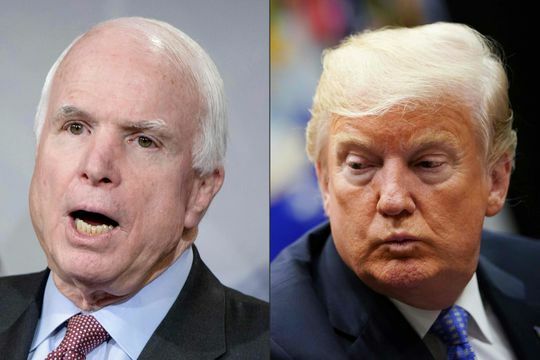 President Donald Trump defended his ongoing attacks on the late Sen. John McCain Tuesday, saying he never liked the Arizona senator over differences that included Russia and health care. “I was never a fan of John McCain and I never will be,” Trump told reporters at the White House, answering a question before a meeting with Brazilian President Jair Bolsonaro. Many are wondering why Trump would continually criticize a dead man, especially one who represented Republicans as their 2008 presidential nominee. During a series of tweets over the weekend, Trump hit McCain over over his handling of a dossier compiled by a former British spy on Trump’s relationship with Russia leading up to the 2016 election. The Trump-McCain feud goes back to the summer of 2015, when Trump kindled it by mocking McCain’s experience as a POW in Vietnam.